The stately surroundings of seventeenth century York House include elegant rooms for holding your ceremony and gardens which sweep down to the River Thames, providing a perfect setting for photographs. There are also several reception rooms for meals and evening entertainment. The Terrace Room and Salon are both approved for civil marriage ceremonies and partnership ceremonies. The rooms are available on Friday afternoons, Saturdays and Sundays. The Registrar has to be booked separately for all ceremonies. 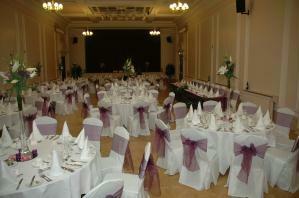 Our rooms are available Friday afternoons, Saturdays and Sundays for ceremonies with or without receptions. If booking for a ceremony only there may be a restrictions on your start time. The Terrace Room is an elegant room with French windows leading directly out onto the Terrace and gardens. It is licensed to accommodate 40 seated guests and 10 standing guest. 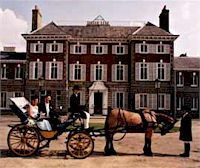 The Salon is an ornate room overlooking the driveway at the front of the house, licensed to accommodate 70 guests seated. The Salon: accommodates a maximum of 60 people seated banquet style. The Hyde Room: accommodates up to 60 people banquet style and is suitable for an evening dance or disco. The Clarendon Hall: offers accommodation for approximately 150-200 banquet style and is also suitable for an evening dance or disco. The Winter Garden: accommodates 40 for a sit down meal banquet style and is suitable for an evening dance or disco. More information is available in the below Frequently Asked Questions section or by contacting a Lettings Officer. There is a two hour maximum stay (9am - 5pm) public car park available at the venue and a multi-story car park in nearby Arragon Road. Twickenham Railway Station is nearby in London Road and a number of buses serve the area. More details on how to get to York House (pdf, 170KB). Can I hold both my ceremony and reception at York House? You can hold both a ceremony and reception at York House. You can also hold just your ceremony or just your reception if you prefer. How does it work if I hire a room for my ceremony? When hiring a room for a ceremony you get an hour and a half in the room. You would get half an hour before your ceremony start time. This would be for your guests to arrive and take a seat whilst yourself and your partner are having your interview with the registrar. The ceremony then takes between 20-30 minutes. The remaining time in the room can then be used for photos etc. What are the maximum numbers I can have for a ceremony? The Terrace Room is licensed for 40 seated guests and 10 standing guests. This is the number that the room is licensed for and therefore is the maximum that can be present in the room during the ceremony. Please see the Terrace Room Ceremony Floor Plan (pdf, 72KB) to see how the room would be set up. Salon - Floor Plan 1 (pdf, 77KB) - This allows guests and the Bride and Groom to enter through the main reception There are three small steps leading into the Salon. Salon - Floor Plan 2 (pdf, 79KB) - This allows guests and the Bride and Groom to enter through the Octagon Room. This is a flat entrance into the Salon. The Winter Garden can seat between 40 and 60 seated guests depending on the layout of the room. 60 is the maximum the room is licensed for and therefore is the maximum that can be present in the room during the ceremony. What are the maximum numbers I can have for a reception? Terrace Room - 20 guests for a formal dinner or 80 guests for a drinks/canapés reception. Salon - 60 guests for a formal dinner or 80 guests for a drinks/canapés reception. Hyde Room - 60 guests for a formal dinner (Hyde Room Dinner Floor Plan) (pdf, 23KB) or 80 guests for drinks/canapés reception. Clarendon Hall - 150 guests for a formal dinner (Clarendon Hall Dinner Floor Plan) (pdf, 84KB) or 250 for a drinks/canapés reception. Winter Garden - 40 for a formal dinner or 70 for a drinks/canapés reception. You can combine certain rooms to allow for slightly larger numbers. However this needs to be discussed with a Lettings Officer. How long do I have to book the House for? At York House you only need to book the rooms that you wish to use. There is a minimum hire period for each room and we do ask that you book all your preparation and clearing time in all the rooms you require as access will only be available within these times. This includes any deliveries or picking up/dropping off of any equipment. There is no storage available for any equipment or supplies before or after your event. How much does it cost to hire the rooms? Charges vary according to whether you are holding a ceremony or reception. For exact costs download the Hall Hire charges (pdf, 55 KB). If you have any queries regarding the prices for hire please contact a Lettings Officer. What equipment is provided with a hire of a room? We will provide and set up tables and chairs in the agreed layout. In the Clarendon Hall there is the option, for an additional charge, to hire our PA system and stage lighting. When hiring the Salon, Clarendon Hall and Hyde room there is a small preparation kitchen which can be used with prior agreement from a Lettings Officer. We do not provide any linen, crockery, glassware, decorations or cooking/serving utensils. Your caterer should be able to provide you with these. We do have a list of approved caterers which we would ask you to pick from. Other external caterers are welcome at York House providing they can supply us with the documents listed on the Catering Waiver Application Form (pdf, 90KB). However please ensure that they are aware that there are no actual cooking facilities on site and that they will only be able to gain access within the times that you book. You are welcome to provide alcohol to your guests free of charge. If you wish to have a pay bar, then one can be hired. Please contact a Lettings Officer for more information on our approved bar supplier. If you are organising a charity event, please contact a Lettings Officer for information on a Temporary Event Notice. There is very limited parking. You will get a number of spaces outside of the halls which are reserved for the duration of your event. The number of spaces will be confirmed by a Lettings Officer when you book. There are several car parks within walking distance of York House.